Under protective custody, in The Soul Blade Chapter 33. This chapter begins the set up for the big climax. I'm getting all my ducks in a row and all those other clichés about getting things in order. I'm also trying to wrap up all the other dangling plot hooks, like Grace's graduation, so that the climax is the end. This was a problem once I realized where I was going during NaNo. I had too much, or so I thought, that needed resolution. Detective McCoy has the name of his prime suspect in the latest killing. No surprise, it's Tricia. And Krista now has a major scoop, thanks to Brenna. Krista should get a raise or a promotion out of this bit of investigative journalism. This is the end of Krista's story arc, such as it was. Brenna could finally say the killer's name to someone. Grace is hitting maximum nervousness. Brenna probably should have tased her, but she's too nice. Officer Henderson, though, doesn't have a sense of humour while working and would stop her. Brenna might be able to claim self-defense; Grace is good at looming. Tricia, at this point, isn't worried about the police arresting her. She's more concerned about her minions, in that she doesn't have a quick way to replace them if the police execute a search warrant on her home. With the Ashen Man as a passenger inside her head, Tricia has access to more magical power than ever. She also sees no reason to not use the energy. To her, there is no such thing as overkill. The result? Four dead police officers and one crushed police cruiser. A note on the research for this chapter. 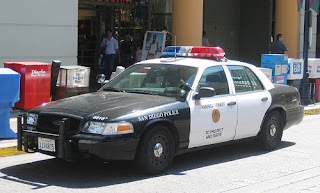 I had looked into what sort of vehicle the San Diego Police Department uses. I was going to put in a place holder, a Ford Crown Victoria, since that seems to be common and was once the car of choice locally. A quick Google revealed that, at the time, the car in use was... a Ford Crown Victoria! Great! That's three words where a vehicle like the Dodge Charger is just two. Then I realized something. Tricia doesn't care what the police cruiser's make and model are, just that there are two cops inside. But, at least I knew what the car looked like before it was crushed. San Diego Police Department cruiser, before Tricia crushed it, photo via Wikipedia. Friday, Halliday family reunion, in The Soul Blade Chapter 34. Also Friday, over at Psycho Drive-In, Deadpool. Saturday, over at The Seventh Sanctum, hiatus week as I will be at CanGames. -Tricia being the prime suspect bears some scrutiny. There's no reason for the police to believe she's behind it, versus an equally valid idea of having witnessed someone else do the deed and then fleeing for her life, going into hiding. Granted, Brenna's ID is what changes that, but Tricia was already their "main suspect" then, versus being simply a person of interest. -Ashen Man Passenger is curiously silent now. Even during the training, when he wasn't saying much, Tricia was annoyed at his interjections. Does he have no opinion on the skeletons? Does he have periods where he needs to sleep? Grace's cleaning fu is starting to get grating for me (seriously, there's not even a point where either girl says it's about nerves or vulnerability, unless "need a break" counts, so she seems OCD) thus I was applauding when Brenna took a stand and pushed her out of the picture. Maybe it's also a foreshadowing of Brenna taking charge to deal with Tricia? Somewhat related, the talk of Grace's dating feels a bit out of place. I thought maybe it would be blackmail material, even if that is a bit of a stretch for Brenna's character, but instead Grace's history sort of sits there. On the one hand, it's good Krista gets some prestige as her arc wraps (it's a better conclusion than she had with the cops), on the other, I feel like she should have at least checked to see if the info might put her friend (or the police) in any additional danger. She was more than the story. (She danced on Missy's car ;). That's kind of amazing, how the police car thing worked out. (I fully admit that like Tricia, with it not being my area of expertise, I wouldn't be able to visualize the difference. It didn't even matter to me which car she drove, though "Econoline" makes me think small, like a hatchback. Except as a van, somehow.) The scene was done well, at any rate, showing a progression of hurting trees to hurting people. Also, boy, Google's been around for a while.